You are on Parking, Main Entrance and Reception. Skip to the next section. For information about the parking, main entrance and reception area please click here (opens in new tab). You are on Entrance (Wetside Changing Village). Skip to the next section. 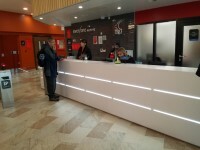 This information is for the entrance located just beyond the reception foyer. You are on Wetside - Changing Village. Skip to the next section. There is step free access throughout the wet side changing village. 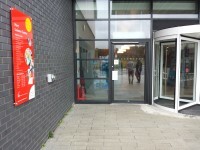 There is a changing places facility located to the left after you enter. The main changing area is located ahead as you enter to the left. The surface of the flooring is non-slip tiles. The are individual changing cubicles with bench seating. 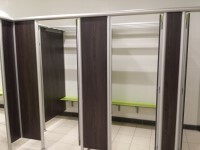 There are family changing rooms available with bench seating, baby changing benches and a play pen. There is a group changing room available. There is an accessible changing room available. 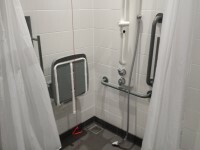 There is step free access into the shower facilities. You are on Changing Places (Wet Side - Changing Village). Skip to the next section. The facility is located to the left after you enter the changing village. The facility is approximately 2m (2yd 7in) from the Wet Side Changing Village entrance. The facility surveyed is for the sole use of disabled people. The colour contrast between the external door and wall is good. The colour contrast between the internal door and wall is good. You do not need a key for the facility. The width of the door is 90cm (2ft 11in). The dimensions of the facility are 300cm x 400cm. There is a clear 200cm x 180cm manoeuvring space in the facility. The transfer space on the left as you face the toilet is 330cm (10ft 10in). As you face the toilet there are vertical grab rails on both sides . There is a spatula flush. 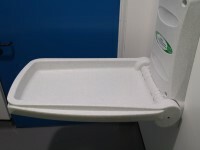 The height of the toilet roll holder is 90cm. There is an emergency alarm for the toilet. The overhead hoist covers all areas in the cubicle. There is a shower unit with a detachable shower head. 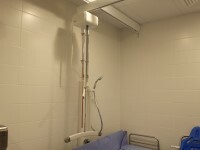 The adjustable shower head can be placed between 120cm and 140cm when mounted. 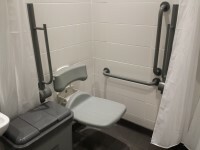 There is a flip-down/tip-up seat for the shower. The height of the flip-down/tip-up or fixed seat is 50cm (1ft 8in). Horizontal and/or dropdown rails are available on both sides of the shower seat. The colour contrast between the rails and wall is good. There is a vertical grab rail. The colour contrast between the vertical grab rail(s) and wall is good. The height of the wash basin is 70cm. 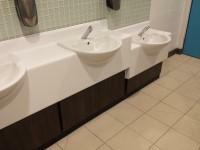 The colour contrast between the wash basin grab rail(s) and wall is good. Wide tear off paper roll is not available. The hand dryer is at the recommended height of 80cm-100cm. There is an emergency alarm for the facility. There are coat hooks in the toilet at 130cm and 145cm from the floor. You are on Accessible Changing Room (Wet Side - Changing Village). Skip to the next section. 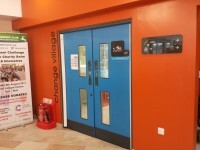 There is an/are accessible changing room(s) available. 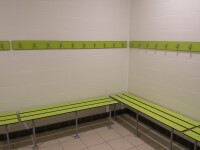 The accessible changing room is located to the left of the corridor leading into the main changing area. 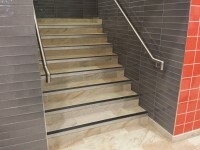 There is level access to the accessible changing room(s). 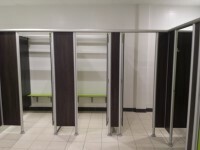 The accessible changing room(s) is/are approximately 8m (8yd 2ft) from the Wet Side Changing Village entrance. The width of the door is 94cm (3ft 1in). 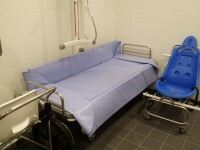 The dimensions of the accessible changing room(s) are 240cm x 250cm (7ft 10in x 8ft 2in). The lateral transfer space is 170cm (5ft 7in). 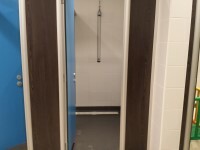 The fixtures/facilities available in the accessible changing room(s) include; a chair/stool, handrails, a drop down rail, a toilet, a wash basin and a wheel in shower. The toilet seat is 47cm (1ft 7in) above floor level. There is a mirror in the accessible changing room. The mirror is not placed at a lower level (60cm from the floor) or at an angle for ease of use. The height of the seat is 50cm (1ft 8in). You are on Accessible Toilet(s) (Wet Side - Changing Village). Skip to the next section. 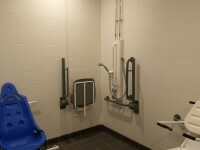 This accessible toilet is located at the rear of the changing village. 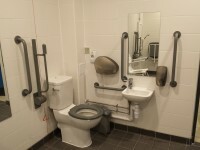 There is an additional accessible toilet with the lateral transfer space on the right in the same location. You are on Standard Toilet(s) (Wet Side Changing Village). Skip to the next section. 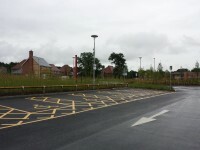 The female and male toilet facilities that were surveyed are located at the side of the changing village. The female and male toilets are approximately 10m (10yd 2ft) from the West Side Changing Village entrance. The wash basin tap type is sensor. You are on 25m Main Pool. Skip to the next section. There is step free access from the changing village to the poolside area. The 25m main pool is located to the left after exiting the changing village, at the centre of the poolside area. 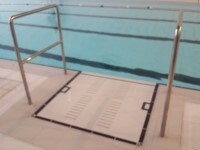 There is a platform lift available to enter the water. 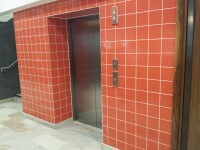 The dimensions of the platform lift are 120cm x 120cm. The controls are operated by a member of staff. The handrails are on the left side as you enter the water. 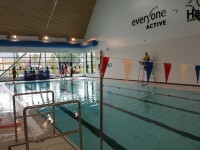 There are two disability swimming sessions each week. They are on Thursday afternoon which is run by the leisure centre and on Sunday which is run by an independent club. For more information please contact the venue. You are on 25m Training Pool. Skip to the next section. The 25m training pool is located to the right after exiting the changing village. 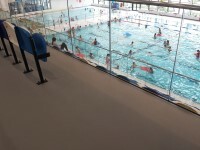 The floor of the swimming pool is moveable and can be raised or lowered depending on the swimming pool's use. The temperature of the pool can be raised or lowered depending on the swimming pool's use. 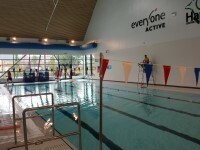 The training pool can be used for Hydrotherapy sessions. You are on 25m Teaching Pool. Skip to the next section. 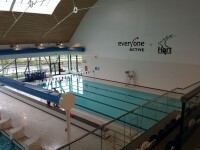 The 25m training pool is located to the left after exiting the changing village. You are on Designated Seating Area(s) (Viewing Gallery). Skip to the next section. 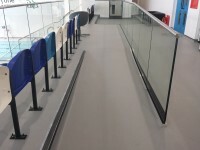 The name of the designated seating area is Viewing Gallery. There is ramped/sloped access to the designated seating area. There is a/are handrail(s) at the ramp/slope. The designated seating area(s) is/are not clearly marked/signed. The view from this seating area is good. Companions sit next to the patron. There is an accessible toilet close to the seating area. 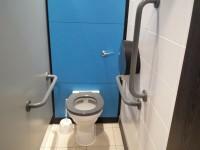 You are on Accessible Toilet(s) (Viewing Gallery). Skip to the next section. 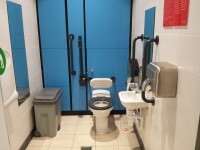 This accessible toilet is located on the first floor, to the left after you exit the lift, next to the viewing gallery. 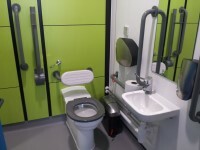 This accessible toilet is approximately 2m (2yd 7in) from the designated viewing gallery. 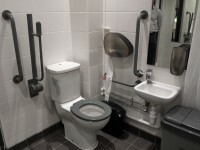 The dimensions of the accessible toilet are 155cm x 195cm (5ft 1in x 6ft 5in). 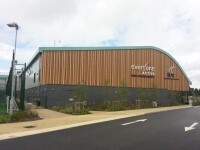 Hart Leisure Centre -Parking, Reception and Cafe link (new tab) - click here.